Loafers! The Madelene loves the loafers! Ellen: I’ve been searching for the Pappagallos I wore in high school as well, but I’ve had no luck. Apparently the company is no longer in existence. 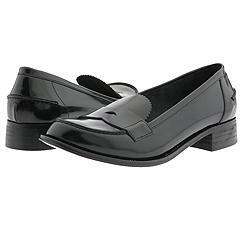 The shoes I’m looking for were butter-soft flats in tons of colors with contracting laces around the sides and a tassle on the front. I had over 30 pairs of these shoes in the mid 60s, but they’re no where to be found, even on eBay. I was thinking of writing to a comparable shoe company and asking them if they could make them. Flats are so popular right, and I think they would be a big hit. Good luck in your search! We must be twins – I live in shoes like that at work! And, I would have chosen the Via Spiga ones, too. I can see spending $200 on a pair of shoes, but anything over that ain’t gonna happen! I also bought mine at the Tweed Shop, where oh where can we find the wonderful shoes of the 60s.